Not wanting to kill my plantings, I am hesitant to spray any weed-killer near the beds—I’ve invested too much time and energy into these flowers to let them die. After some research, I found that pulling the Charlie by hand, then smothering the remains with newspaper is an effective option. However, seeing as though we do not subscribe to the local Press Gazette, we have no newspapers. My immediate reaction was to get whiney and give up. I didn’t want to bother anyone to ask them for their old papers. I wasn’t comfortable asking local businesses to save some for me. I didn’t want to make the effort to go to the recycling center and collect some. I didn’t want to spend the money to subscribe to the paper either. It was amazing to me the number of reasons I could find to put off the project. After realizing all the stumbling blocks I was setting up for myself, I came to my senses; and now, with gratitude, I happily collect old papers from my neighbors and friends. 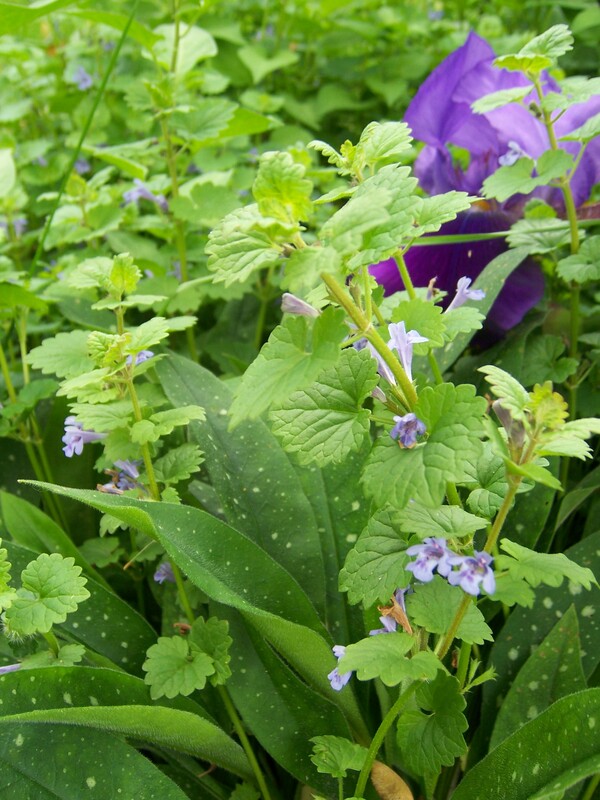 Good bye, Creeping Charlie! There is an ancient Silver Maple tree in our backyard. It stands above all the other trees on our block. Every spring it showers us with thousands of whirlybird seeds. I’ve been cleaning up these helicopters for months now. I’ve raked them out of the lawn and the flower beds. I’ve swept them off the driveway and the sidewalks and shooed them out of my house when they inadvertently found their way inside. This morning, I found this solitary seed in the center of my concrete patio with no hope of finding the soil it would need to sprout. It struck me the number of these seeds that never have the opportunity to reach their potential–how many have been swept up and discarded, eaten by chipmunks, or uprooted as weeds when they were seedlings. The odds against a maple seed creating another mature tree seem astronomical. 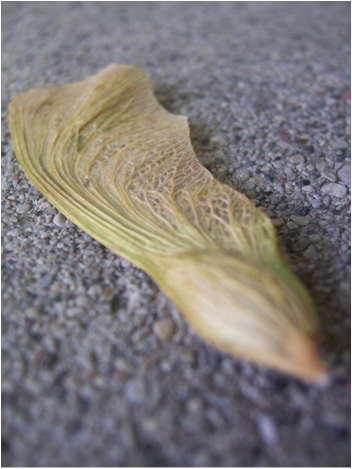 Every year, without fail, that Silver Maple creates thousands more helicopters and releases them—each one carrying the potential to become a giant.